"On leaving the College I went to Sheffield University to study politics (was else). 3 years of drinking and playing rugby followed with a last minute cramming session before finals. During this time I met my (first) wife and as she was a nurse in Sheffield applied for jobs to stay there. However this was the depth of the Thatcher recession so I was forced back South and finally got a job in the civil service. I was by far the worst civil servant ever and so concentrated on becoming a trade union branch secretary. I married in 1984 and living in South East London became a Councillor in 1986 where I became chair of the planning committee at the time when Charlton Athletic were applying to return to the Valley. The history of the case can be found on the Web but my fate was sealed by an excellent campaign by the Valley Party leading to my losing my seat in 1990. By this time I was working in Housing having benefited from a bit of political patronage and so having lost my seat did an MSc in housing despite also finding the time to have 3 children (including twins) with my wife. I returned to the Council in 1994 but by this time my marriage was breaking down and so I did not stand again in 1998. I remarried in 2000 and started work in 2002 as head of housing management at Kingston Council where I remain, and because of my position am barred from political activity although I still have ambitions to return. Blunderbuss can share news of Simon’s exploits with the Council as reported in the Surrey Comet of 16 February 2012 under the headline Council could bin widow's pot plants. This seems to lend itself to all sorts of interpretations, worthy of Blunderbuss! It also reminds us of the mantra from BBC1's rather hit-and-miss comedy The Wright Way, "Our job is to minimise risk, even where no actual risk exists". A further news report on “New Malden families spitting feathers over pigeon droppings” also involved Simon and can be read here. 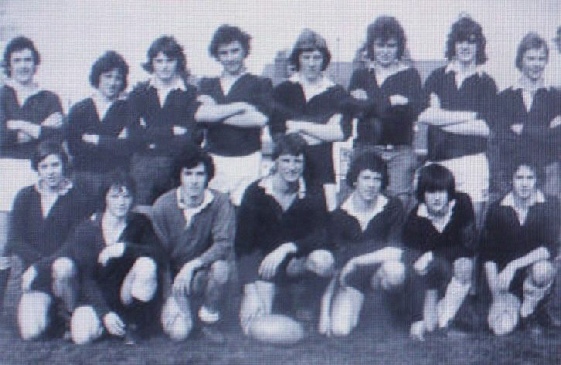 Simon can also be seen in the centre back row of this photograph of the 1977 College Rugby team.